Home / Posts tagged "Decentralization"
Manish Dhingra focused on “how to build a quick solution to inculcate Knowledge Sharing in an organization, using the raw power and versatility, structured blogging (SB) gives you.” Here is his PPT presentation. Dave Pollard on efficiency, effectiveness or value of information processes or content: “Most organizations, too, refused to abandon the top-down centralized information model that was already in place, merely institutionalizing it with firewalls, access restrictions, monster centrally-managed one-size-fits-all databases and websites and over-engineered, over-managed collaboration and community-of-practice tools. Democratizing corporate information entails the devolution of decision-making and other power to front-line workers, and executives are understandably nervous about this. Revamp and upgrade the role of Information Professionals from content managers to personal productivity enablers. Reintermediate Information Professions to filter and add more value to external content. 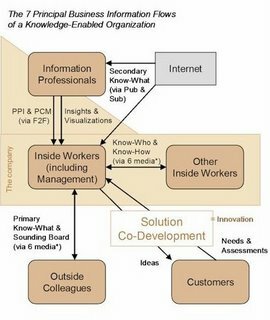 Develop simple, automated, Pub & Sub mechanisms to encourage and enable workers to ‘publish’ their knowledge and subscribe to that of others, inside and outside the organization. 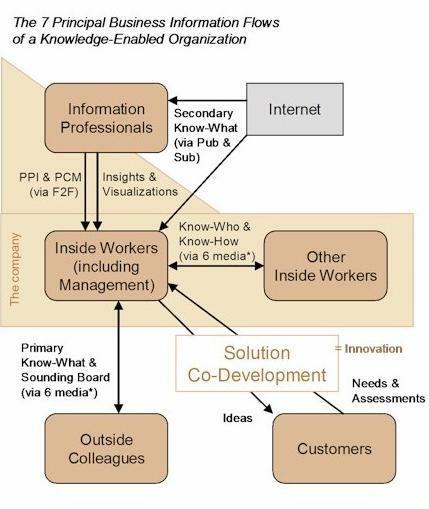 Create new media to allow workers to obtain and share ‘know-how’, ‘know-who’ and ‘know-what’ information from colleagues both inside and outside the organization.